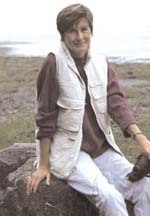 Susan Shaw, the energetic executive director of the Marine Environmental Research Institute (MERI) in Blue Hill, Maine, believes that seals in the Gulf of Maine can alert us to threats to human health. "Just as the songbirds in Rachel Carson's Silent Spring warned of the approaching dangers of DDT pollution, so can observations of our local seal population inform us of imminent threats," she says. "Wildlife signal us about toxic chemicals in our shared environment, and we need to read the signals correctly." Dr. Shaw, an environmental toxicologist and public health professional, founded MERI 12 years ago to conduct research and provide education on the impacts of pollution on marine life and human health. "Marine mammals like seals are important in their own right and also as significant sentinels for ocean health and the effects of pollutants in humans," Shaw says. Since they are at the top of the food chain, seals and other marine mammals are vulnerable to accumulating dangerous levels of persistent organic pollutants such as PCB's, DDT and dioxins by feeding on contaminated fish. Humans who eat fish share some of the seals' dietary preferences and potentially face similar health threats. A U.S. Geological Survey (USGS) research site on Cape Cod will close in September if Congress approves the proposed cut of the agency's $13.9 million Toxics Substances Hydrology Program from the federal budget in fiscal year 2003. Since 1983, the USGS has studied an underground sewage plume emanating from the 22,000-acre Massachusetts Military Reservation (MMR) in an effort to understand the processes that affect the behavior of contaminants in groundwater. Sewage is the most common threat to ground water purity in the United States. What scientists learn from the Cape Cod site can be applied to remediation at other contaminated aquifers nationwide.